Stockton is a city that is the thirteenth largest city in the territory of California. The city of Stockton is located in San Joaquin County. Stockton houses 291 707 people. 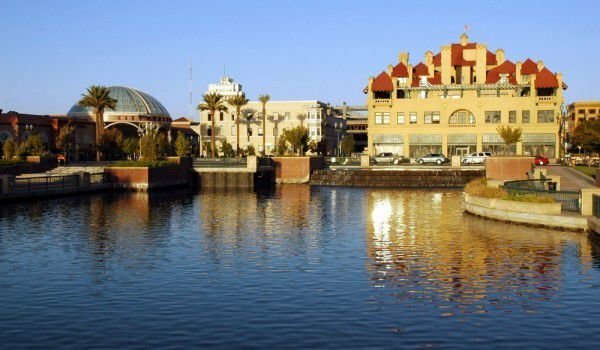 The history of Stockton began in ancient times, when on the territory of today's city lived Miwok Indians. They felt good because there was enough food and water that serve the Indian water supply and transportation to remote locations using canoes. To the north is San Joaquin Valley, and around it passes an ancient road known as the Siskiyou Trail. It led to the Sacramento Valley. In 1848, German immigrant Captain Charles Maria Weber decided to try his luck in the gold mines. But he quickly discovered that more profitable is the demand for gold prospectors service. He started a partnership with William Gulnae, who was married to a Mexican. Weber founded on the territory of today's Stockton Rancho Campo de los Franceses Mexican, in 1849 years was founded the city of Stockton. The place where Captain Weber built the first home within the San Joaquin Valley, is known as Weber Point. Stockton over the years has changed its name several times. Among the names given to the city, was Mudville. The idea of Captain Weber Stockton was for the city to be called after Robert Stockton, his favorite military personality. Stockton was the first city in California, whose name was not originally Spanish or Indian, unlike the names of other places and cities. Stockton was officially declared city in 1850 and the first elections for the City were in the same year. The first settlers in Stockton were mostly prospectors who arrived in the region from Australia, Europe, Mexico, Canada, Asia and Africa. Historically, this influenced the diversity of architecture of the city, as well as its historical and cultural diversity. Here, for many years, are held various ethnic festivals. In the late nineteenth century, here was based a company producing mechanical plows and tractors. Tractors that crawl like caterpillars... British Major Ernest Swinton sensed the potential of this way of movement. He advised the military to adapt this model for a vehicle that is bulletproof. So the tractor, built in the Stockton, became a petrol-electric tank. During the nineties of the twentieth century, Stockton has undergone a revival procedure. The parking in front of Hotel Stockton was transformed into a public park, known today as Dean DeCarli Square. The park has shady canopies, large amount of trees and different plants, different sizes and designs of benches and a beautiful waterfall. The park is regularly host to all sorts of festivals, musical and open exhibitions. On the territory of Stockton is celebrated the world famous Asparagus Festival. The city museum is Haggin Museum, which is dedicated to the history of art and is located within the Victory Park. In the museum are the works of the nineteenth and twentieth centuries.